This is an overall view of some of the more important instruments of the Shadow Theatre of Anaphoria. 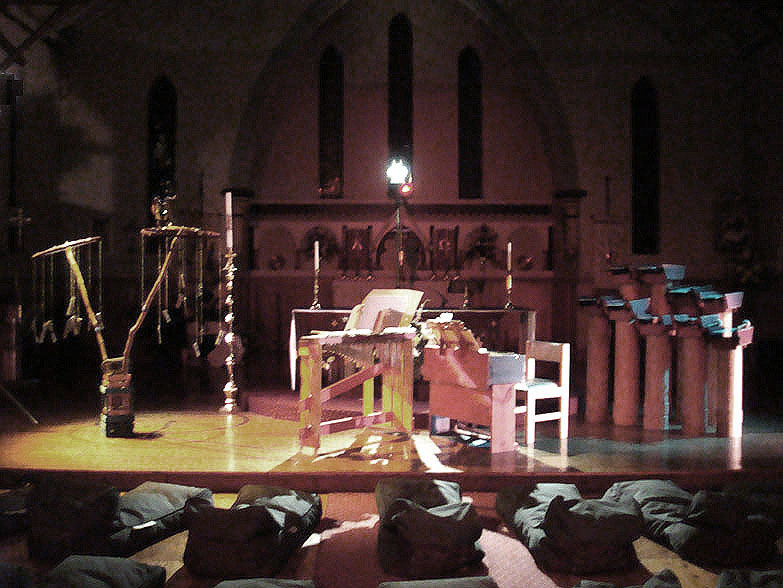 Here the setup is in preparation of an all night dream performance often used as a preliminary ritual for the performers themselves. Special cushions can be seen in the front where those not playing allow themselves to experience guidance in dreams for the upcoming event. 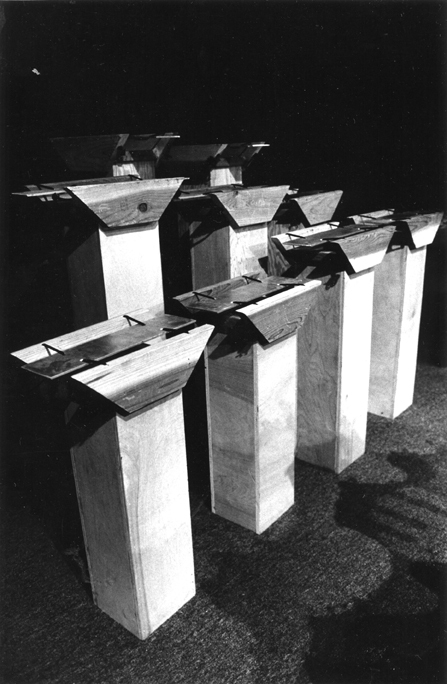 Depending on the location of the shadow performance, the audience is often met with this instrument known as THE GATE which serves to clear those entering of any unwanted residues of their ventures to the performance. 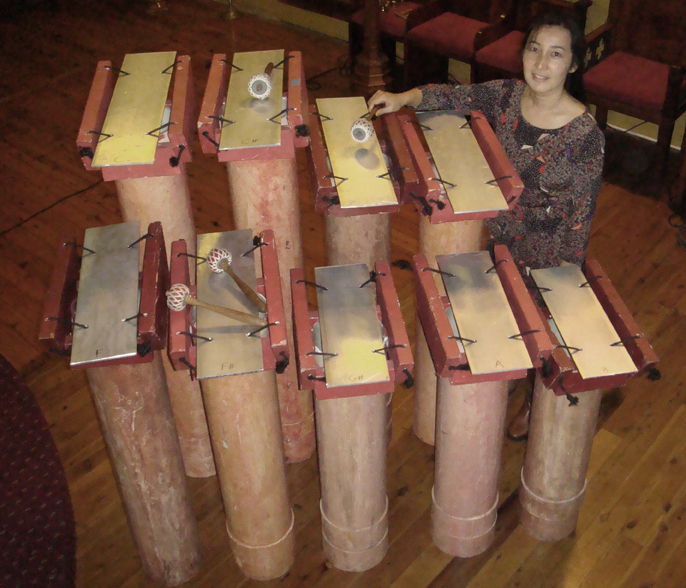 The instrument centers around 12 sets of wooden bars spread between 3 octaves which are played by scraping hard mallets in a downward motion. The effect one gets when having a large wooden ensemble playing in unison. 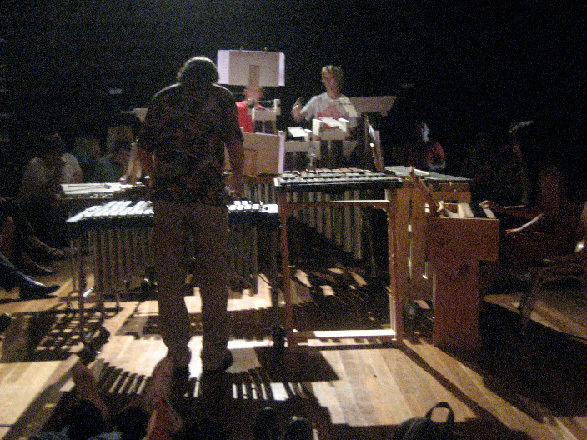 Percussion instruments are sometimes used as seen here to further banish energies thst might interfere with the performance. This instument called THE POLES is a modular tube instrument where the tubes are suspended in the middle instead of their normal nodal points. 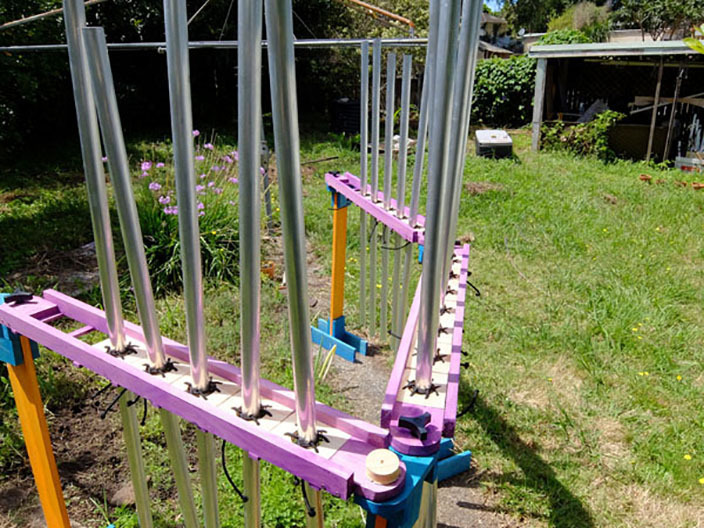 This requires twice as much material to make the same pitch with the conventional mounting nevertheless is louder in volume and requires no resonator. The tubes can be shuffled into any order making both set melodic patterns and or even chordal arpeggios that can be strumed from side to side. 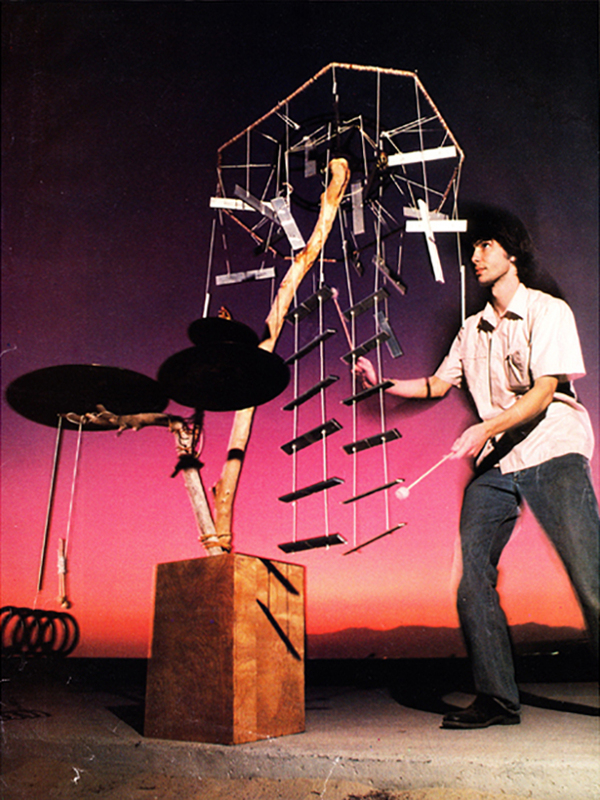 Similar in effect to tubular chimes in sound but with more sense of pitch. In the late nineteenth century, there occurred on our island what is known as 'The Great Missionary Expulsion'. 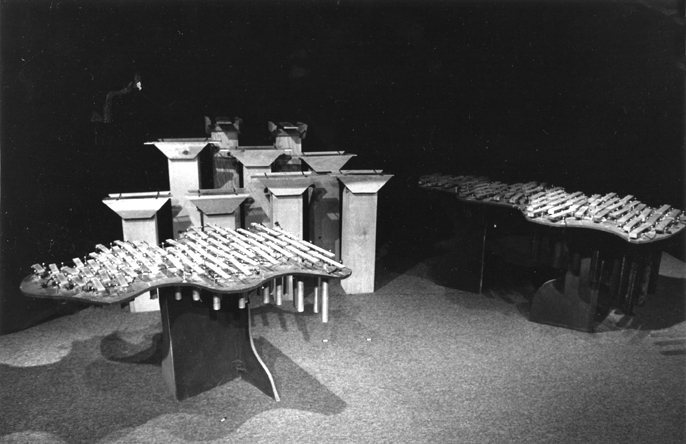 As a result, many western instruments had to be abandoned by their owners. 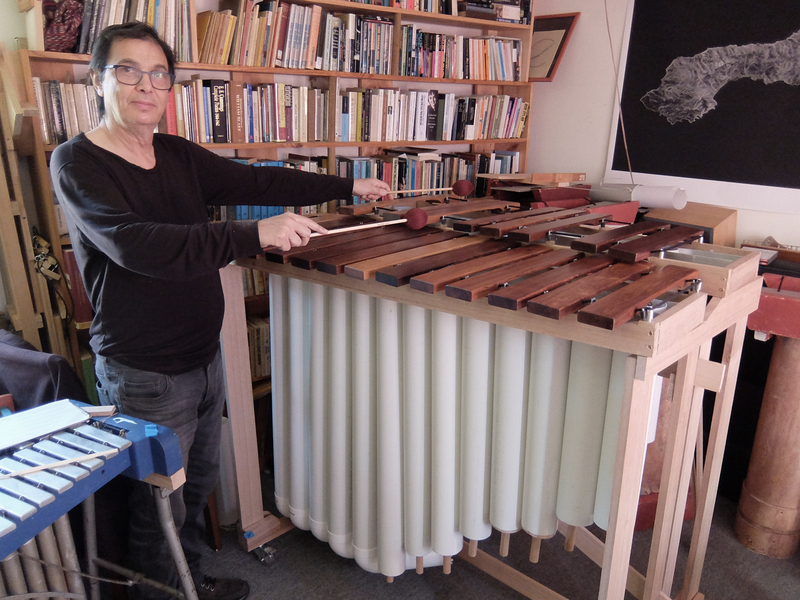 After being shunned for years, an instrument builder from Lipari realized that the reed organs could be retuned to a Slendro-like scale. Very pleased with the sound, he incorporated it into his ownpre-existing ensemble and we have done likewise. 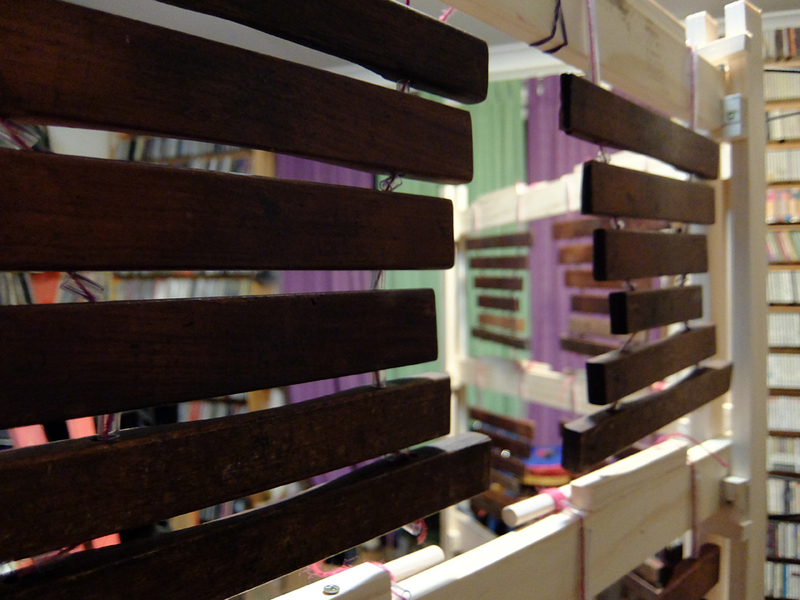 Presently there are two reed organs in working condition. 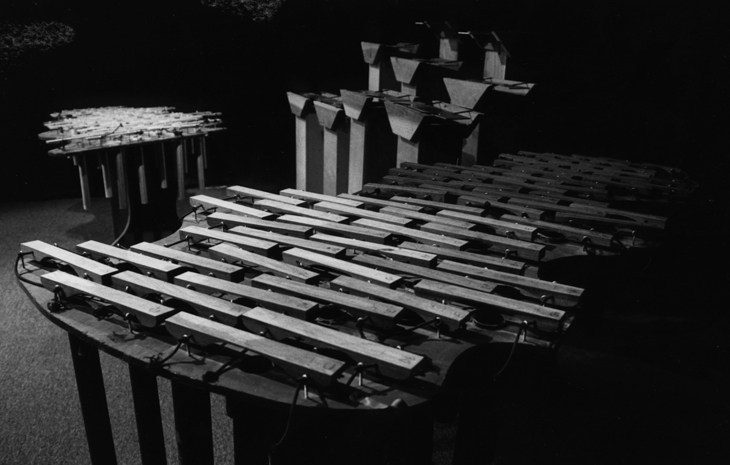 As word spread, such retunings were applied to the vibraphones and other instruments that had not been destroyed. At first, the tuning comprised just two sets of Pentatonics, one slightly higher than the other. Because of Erv Wilson, who traced the origin of the traditional scale to a great sage, we now know it was derived from a 4,000 year old diagram called Meru Prastara in India. Thus the two remaining tones could be incorporated into a 12 tone scale implied by the diagram allowing some modulations consistant with it tradition (more can be found on this scale in the Wilson Archives under The Scales of Mt.Meru). Although appearing like their western counterparts, they bear little or no common ground with the tuning from which they have been changed. Due to their compact size most of these have found a home in the Shadow Theatre. The above instrument has now been extended (2017) to a 17 tone scale. Here are 9 of the 12 Meru bars tuned to this scale as ofen only a subset is used. 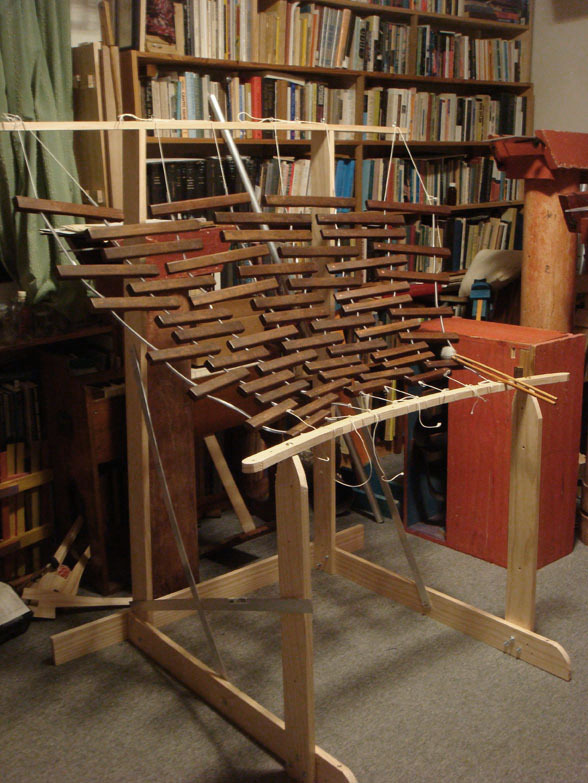 Going even lower is THE BASS MARIMBA, the newest addition to our ensemble shown here before the addition of the bench needed to play the instrument. Here is a newer version of an instrument known as THE TREE is found in only a few special older ensembles. This one is even more special in having with two branches instead of the original one (seen below here) allowing greater melodic material available. Since the bars when struck rotate, it provides an interesting phasing like effect not possible with rigidly suspended bars. THE FOSSIL (pre-painted) gets it name from looking like those region on the island where both the skeletons of both whale and schools of small fish can be found. This instrument expands the normal 12 tone range of Meta-Slendro to 17 tones set up in a generalized pattern. The arch is adjusted to the individual player making the movement easier and more grace like. 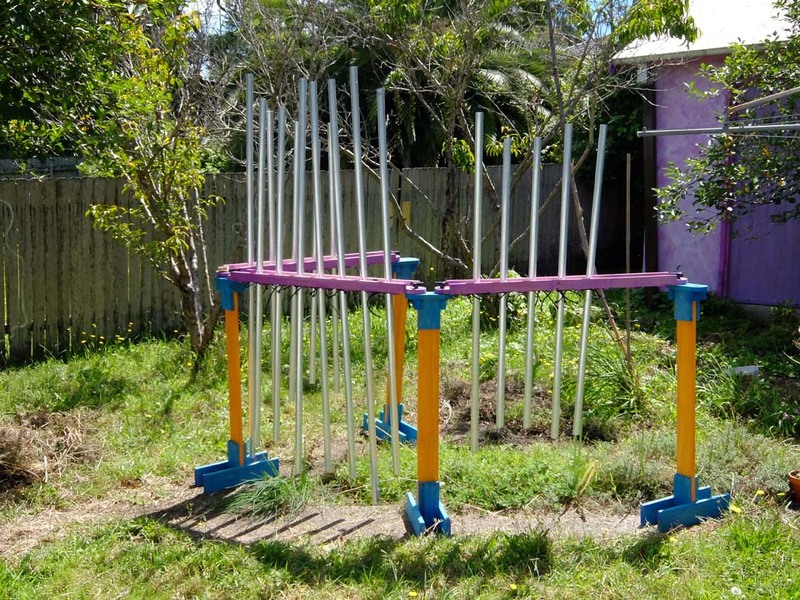 Other vibraphones and like instruments exist including a 4 octave returned marimba and a bass Marimba is being built off island at the moment of which are looking forward to ccompleting by June 2017. 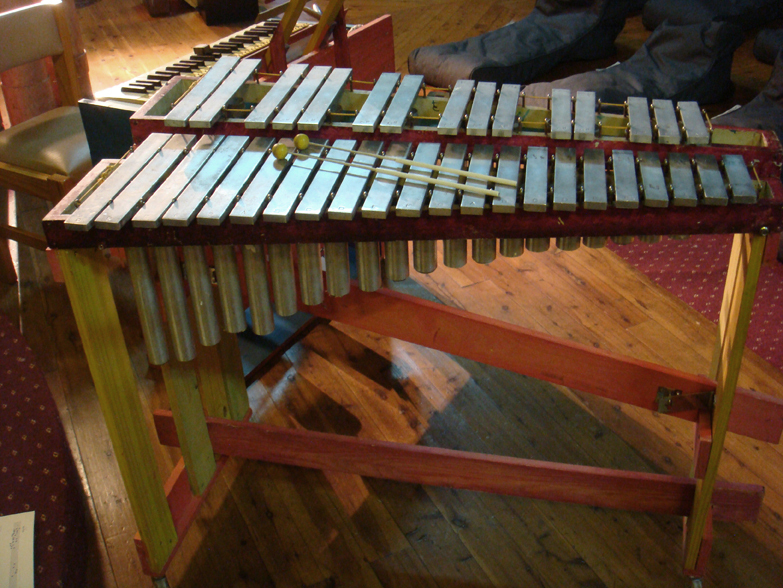 Lake Aloe spans 2 1/3 octaves and is a 22-tone instrument in the tuning known in the west as an Eikosany (Wilson 1969), constructed out of the harmonics 1-3-7-9-11-15. See more on the Eikosany below. Built and reconstructed with David Mota. This is only one of the many versions of Mt. Meru found in Anaphoria in both tuning and layout. 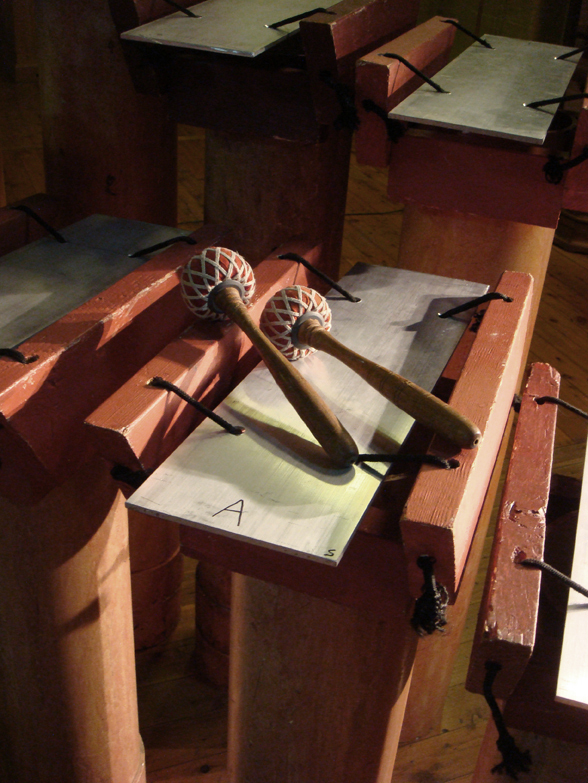 This particular instrument encompasses 9 tones from the same Eikosany as Lake Aloe. Built and reconstructed with David Mota. 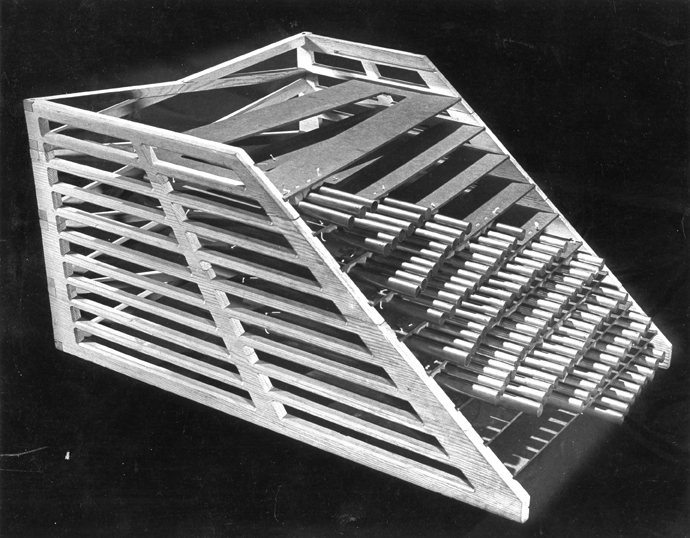 Fifth Mesa, a marimba-like instrument made out of Padouk, spans 3 1/3 octaves, extending an octave lower than Lake Aloe. Built and reconstructed with David Mota. Last of the instruments in this tuning but second in age only to the Crib above is called the Tree. 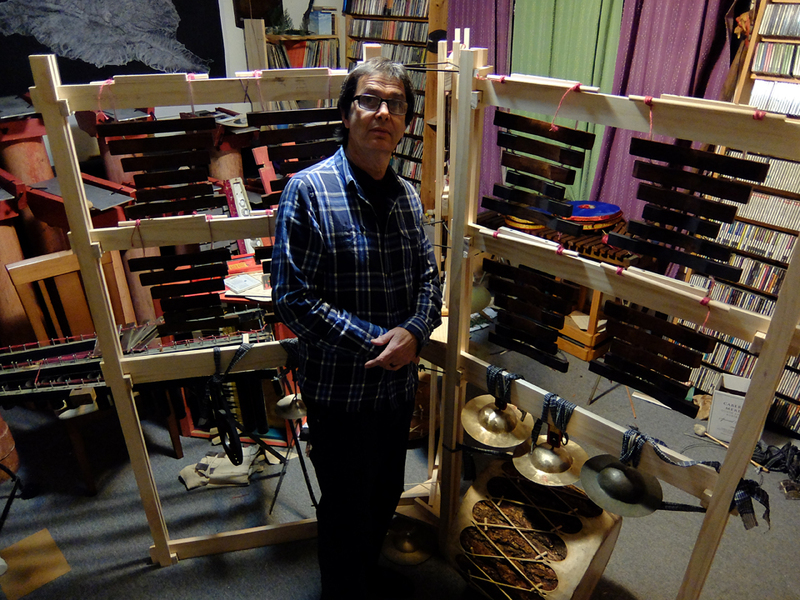 The tuning was to the 20 member Eikosany hanging in 10 tone star pattern with the flanking harmonic and subharmonics series hanging like two ladders. 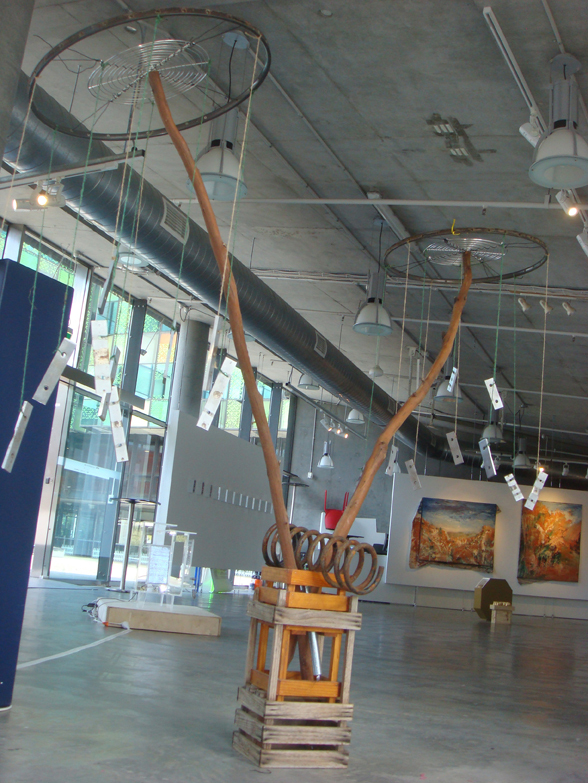 Newer versions of the Tree have been built and can be seen above. 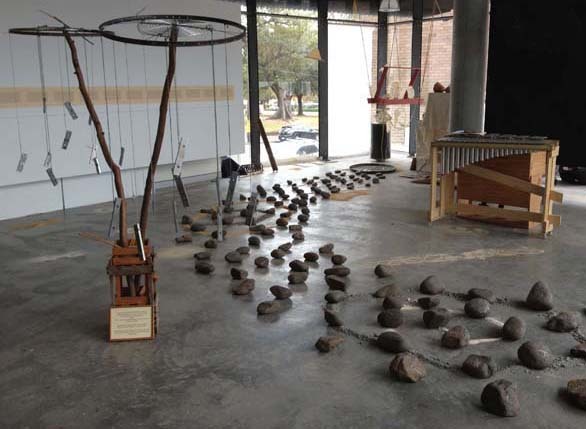 It is the Anaphorian Hammer Dulcimer instruments that seem to have adopted this tuning. 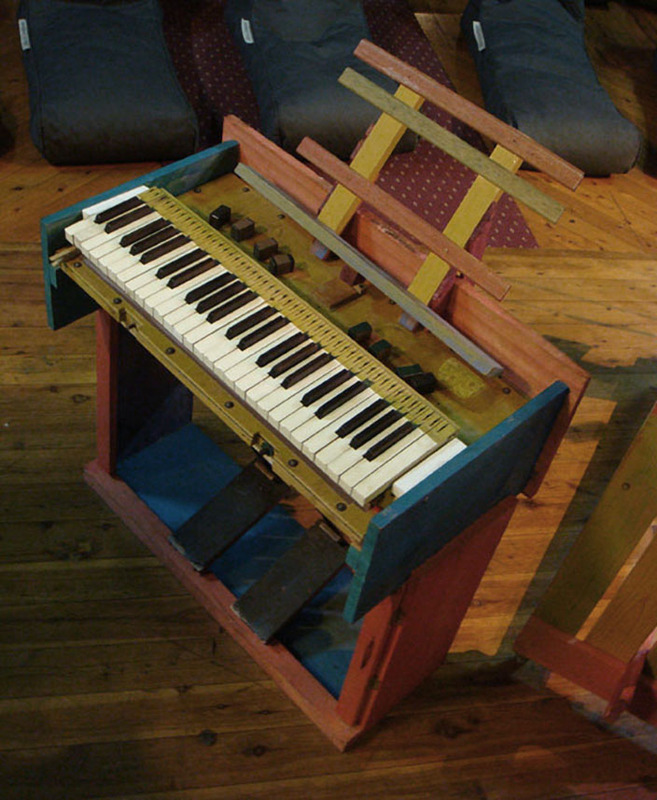 Often found with a reed organ with only 9 tuned reeds. 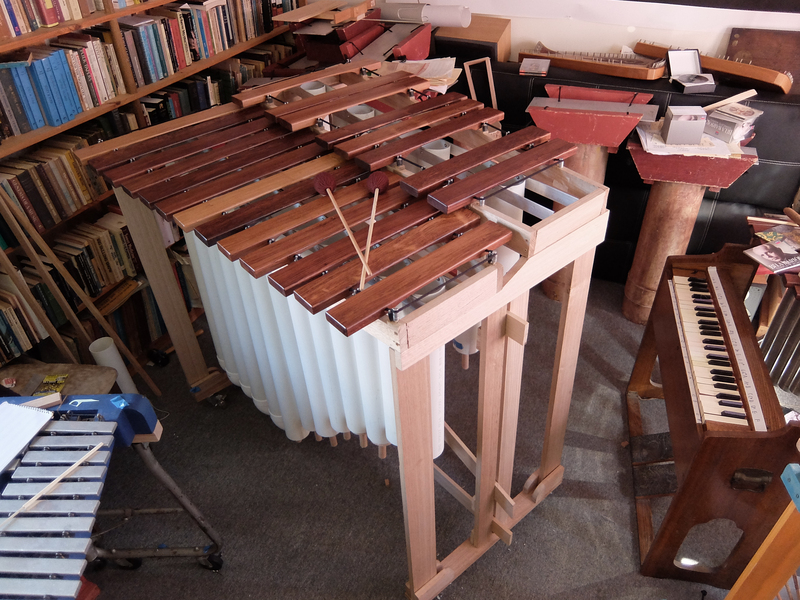 in progress is a 9 tone vibraphone and a bass marimba. The great influx of immigrants to Anaphoria since time immemorial has brought many of the wide variety of scales now thought of as Anaphorian. In many cases the mother culture is apparent while in others the origins disappear into ancient prehistoric traditions almost impossible to penetrate. The problem is also complicated by the fact that these scales' proximity to each other have produced a myriad of cross-interpretations, influences and even hybrids. Anaphorian legend states that music was given to mankind by the Earth goddess Danae and Sky god Kukuk. It was in the famous cave of Celudore where they would meet in embrace. In gratitude to their hosts, they left behind a stone carving over the opening of the cave. This tablet, the Tablet of Celudore (shown above), is one of the most ancient artifacts in Anaphoria. Archeologist have placed the dates of this tablet between 8,500 to 3,700 years old with a preference for earlier estimates. Composed of unknown cryptic symbols, it took the Indian mathematician Deep Kama to realize it as a representation of a figure known in her country as Mt. Meru (known also as Pascal Triangle, seen below, in the west). Kama conceded that being older than its counterpart in India opens up the possibility of the two sharing a common origin. As manifestations of sacred impulses, Anaphorian scales exhibit very specific constructs inspired by organic as well as geometric analogies. Numbers in Anaphoria are seen as "divine objects" found in the creative imagination that function as the intermediary between the spiritual and the material. In this inner "temple" these two worlds are seen to coexist and only in this temple do new scales come about. Observation has caused Anaphorians to believe that whereas a plant still preserves it first limbs and branches throughout its growth, scales preserve their more ancient forms yet develop into predictable but unexpected constructs. With the realization of scales into concrete instruments, this inner temple becomes an outer temple that encompasses whole groups of people in a shared experience. In the 1980's, individuals in Anaphoria first became aware of various scales of the American/Mexican theorist Erv Wilson. For the next few years there existed a great controversy over the coincidence that his scales and systems appeared to solve many of the dilemmas confronting Anaphorian theory that had developed into heated debate The outcome of this controversy was the rejection of his scales by "official" academic circles only to find the masses of practicing musicians and ensembles widely adopting his scales. On the other hand many of these people were disappointed that Wilson did not (at least publicly) share there own spiritual conceptions. He did in fact exhibit respect for their inclinations.